There are a vast number of characters in the Harry Potter series that can qualify as heroes. I would say that almost every character – that wasn't a Death Eater – had a moment of pure heroism in times of trouble. 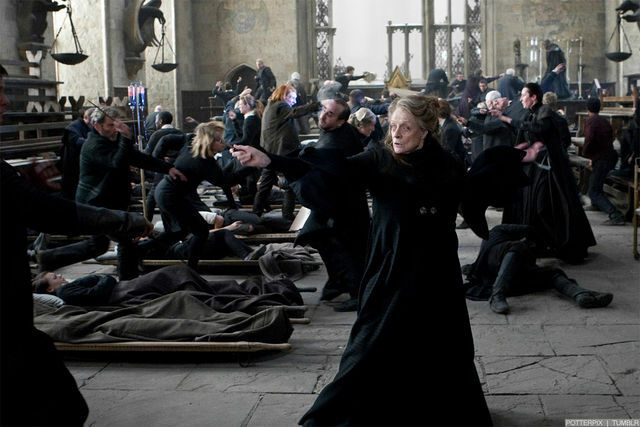 Dumbledore and Snape certainly get a lot of praise for their dedication to Hogwarts (with good reason, of course), but we sometimes forget to highlight the heroism one of the most important and badass headmasters in Hogwarts history: Minerva McGonagall. Imgur user by729464 recently posted a series of GIFs that illustrate just why Professor McGonagall should be everyone's favorite teacher. I've taken the already awesome list and expanded upon it a bit. Why beat around the bush? It was sheer dumb luck that the trio survived that troll! Because she was such an honest person, it was easy for her to earn the trust of her students and peers. Best Head of House at Hogwarts for sure. Who else looked out for their students like McGonagall? Weasley twins, that means you! Even if it was towards someone that she isn't particularly close to, she was basically a big softie on the inside. Sure, Molly Weasley and Sirius definitely played their roles in Harry's life. But when Harry was at Hogwarts (a majority of the year) McGonagall kept an eye out for Harry and his made sure that he felt safe and cared for. Basically Harry's school mother. 7. And got him interested in Quidditch! Quidditch, probably one of the most important things to Harry as he was growing up, might not have been introduced to him had McGonagall not spotted his potential during his first year. Would Neville have had such a good time at the Yule Ball had it not been for McGonagall's instruction? Not that that's really indicative of her being a great person or anything, but it's pretty damn cool. Plus, she was the head of the Transfiguration department, so it's safe to say she was pretty brilliant. I think that the entire theater erupted into applause at this point during Deathly Hallows: Part 2. Let's have a quick shoutout to the actress who brought Professor McGonagall from off the pages of our favorite books, Maggie Smith. In 2007, Dame Maggie Smith was diagnosed with breast cancer, but continued to work through her chemotherapy and finish Harry Potter and the Half Blood Prince in 2008. And during the filming of Harry Potter and the Deathly Hallows: Part 2, she had shingles, but still managed to film the final installment of the series. I couldn't even imagine any other actor playing McGonagall. Not only is Maggie Smith an absolute gem of a woman, but in my mind she is Professor McGonagall. 12. In short, she's a total badass. Just some of her many accomplishments include being on the Gryffindor Quidditch team, Gryffindor Head Girl, an employee for the Ministry of Magic, Head of the Transfiguration department, Headmistress of Hogwarts. Brilliant Quiddich Player, Head Girl, Former Ministry of Magic employee, Animagus, Silent Caretaker of HP, Head of Transfiguration Dept at Hogwarts, Head of Gryffindor House, Deputy Headmistress of Hogwarts, Head Mistress of Hogwarts, dueled with the dark lord, & is truly the personification of badass. Cheers to you, Professor McGonagall! Which HP Professor is your favorite?